The Dawning.ca Project was something I started out of boredom back in 2001 while in grade 12. There was a 3 week long teachers strike, I suspect I got more done in that time than I did in most months of high school. Ohh the irony of closing a school and boosting education. Anyway, since that time the website has undergone a few major changes, for the sake of interest I’m chronicling them here. The very first iteration of Dawning.ca has been lost to the erosion of time. I barely remember it, but it was one of those Web 1.0 sites where all pages were individual static html files. Of course everything was hand written with Vi.Â I recall that I had a few images with text in the images as I found it a good way of making sure fonts were “supported”. Suffice to say, this iteration didn’t last long before I replaced it. The next major iteration of Dawning.ca stuck for quite awhile. It was similarly basic like the first version, still a set of static html pages, mostly.. This time I had crude use of PHP to “include” different static pages in to one place. It worked well enough for then. This version of the site also had a blog component, unlike before. I found this version slowly grow in content for quite awhile. Of course this version was also hand-written with Vi. I also had a few aspects of the site being randomly changed with a PHP random function call. It was crude, but functional. The third iteration of Dawning.ca was a challenging step forward. It was only in service for about a month or so, but it took me a few months to build. This version was heavily built on PHP. I had a single PHP main function that generated most of the pages. I used html forms all over the place for navigation rather than html links. Tacky, for sure, but at the time it was the only way I knew to get my links looking “Cool”. I also had some basic CSS work going on this site. However the next iteration quickly clobbered it as I found a better way of doing things. 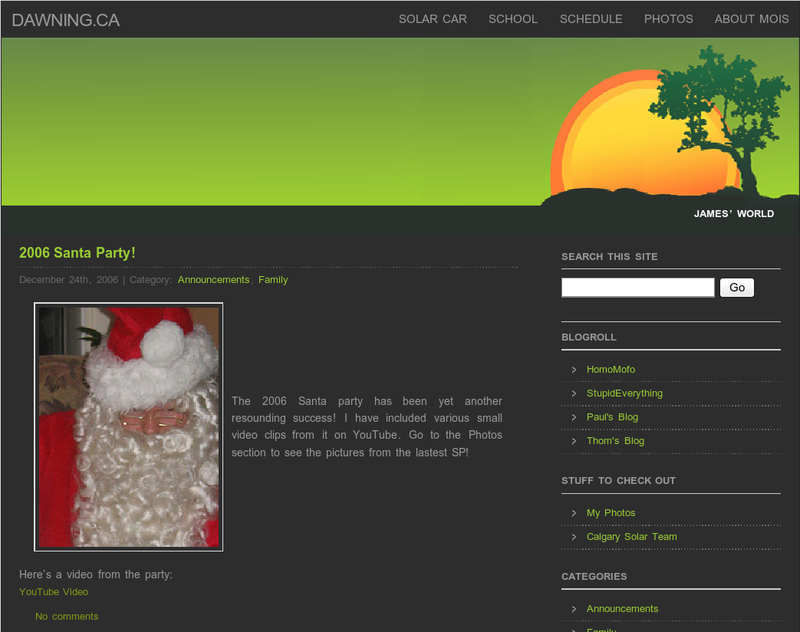 The current iteration of Dawning.ca began when I discovered the ever-wonderful WordPress. As much as I prefer to do things by hand I found that WordPress had so much to offer that I decided I was foolish not to use it, at least for awhile. Well it turned out that using WordPress led me to learning a fair bit more about PHP (which it’s written with). I’ve had fun easily integrating this generation of Dawning.ca with various other sites such as Facebook, Flickr and lately Twitter. The WordPress iteration of Dawning.ca has endured for awhile yet. Lately I’ve considered re-developing the site by hand using the Django framework. I’ve used Django for several projects, one of which a massive one.Â And the desire to return to something hand-made is getting stronger, especially as I can now reproduce all of the functionality I use with a Python implementation. However, for the time being, I retain the WordPress version, in part because I’ve now built WordPress sites for others and want to stay current with WordPress.